Since its debut in 1983, the 10 mm Auto has maintained a small but dedicated group of supporters. In recent years, though, there’s been a striking upsurge in the cartridge’s popularity, prompting arms makers to produce additional models chambered in the resilient round. 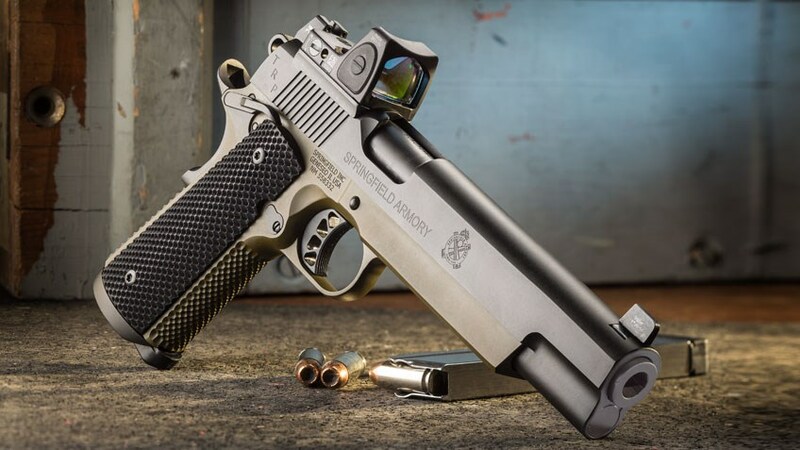 Among the newest offerings are Springfield Armory’s 5″- and 6″-barreled 1911 TRP 10 mm RMR pistols, the latter of which is reviewed here. 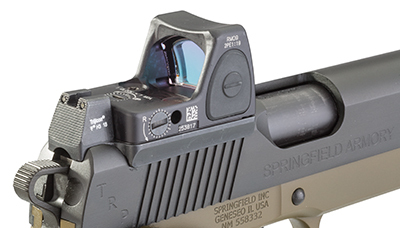 The Springfield’s raised tritium iron sights and factory-mounted RMR red-dot sight, all from Trijicon, allow the shooter to co-witness both sighting options on the target. In addition to the RMR, the forged-steel slide is equipped with Trijicon night sights in the ubiquitous three-dot pattern. The dovetailed, post front and non-adjustable, square-notch rear are of sufficient height to co-witness with the RMR, which is secured to the slide by way of an intermediate mount. The slide has bilateral rear cocking serrations, with a slight forward angle, to aid in compressing the 16-lb. recoil spring. 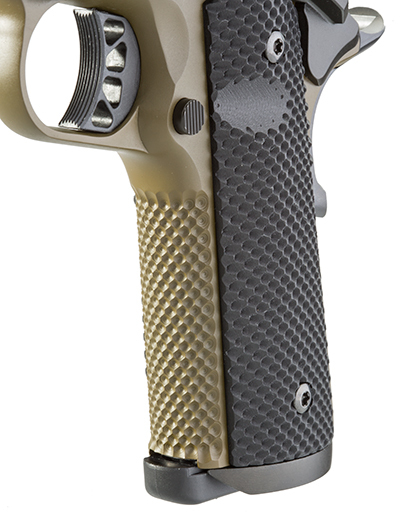 As an aside, the 5″-barreled TRP 10 mm RMR has a stiffer, 18-lb., 8-oz., spring. Enhancing the durability and corrosion resistance of both the slide and frame is the Black-T finish. Within the slide is a bull-contour, match-grade, stainless-steel 6″ barrel. The nitride-finished barrel, which has a polished, integral feed ramp, measures 0.696″ in diameter at the muzzle. Full access to the barrel is possible only after removal of the recoil spring and its housing; there is no traditional M1911 barrel bushing. Like the slide, the forged-steel National Match frame features the Black-T finish, albeit in a complementary OD green hue. Depressions in the frame ease access to the trigger, and a similar recess in the left-side G10 stock panel does the same for the thumb safety. Concerning the stocks, they have an aggressive pattern similar to that of the frontstrap and mainspring housing; coined “Posi-Lock,” it’s essentially a cross between traditional checkering and dimpling, and it greatly increases purchase. The extended magazine well base is beveled to quicken magazine changes. Springfield’s Posi-Lock checkering—on the pistol’s frontstrap, mainspring housing and dimpled G10 stocks—helps to anchor the gun in the hand during firing. The TRP 6″ 10 mm RMR has both a bilateral thumb safety and a beavertail grip safety. In addition to preventing an unintended discharge, the latter prevents “bite” from the skeletonized hammer. Other fire controls include the magazine-release button, located on the left side on the frame, and a skeletonized Gen 2 Speed Trigger. According to a Lyman Digital Trigger Pull Gauge, the sample pistol’s trigger broke at 4 lbs., 13 ozs. There was no discernible creep or overtravel, and reset was remarkably short—a fine trigger for sure. Accompanying each pistol are two eight-round, single-stack magazines. The stainless steel units have metal followers and feature witness holes and large slam pads. Springfield’s 6″-barreled TRP 10 mm RMR is a large, heavy pistol; measuring 9.6″ long, 6.4″ tall and 1.43″ thick, so it’s little wonder why the mostly steel gun weighs 50 ozs. unloaded. While the weight is a blessing for attenuating recoil—perceived recoil is relatively mild—it also limits carry to an extent. It’s unlikely that you’ll lug the pistol outside the home unless for big-game hunting, an application in which it would excel. On the range, cycling problems emerged shortly after testing began and persisted through a high-volume “function-testing” phase. Stoppages due to incomplete lockup required the evaluators to manually force the slide forward, and some noted that the gun’s fit seemed exceptionally tight. After consulting with the company, the pistol was returned to the factory for inspection. Following a thorough examination, including test firing, Springfield reported that the failures were likely the result of insufficient grip, commonly referred to as “limp wristing.” As consistency in cycling had improved as our testing progressed, we attributed it to new-gun gremlins. Nonetheless, a second pistol was sent and, employing the same testers as during the first evaluation, it exhibited none of the issues of the first gun and operated flawlessly throughout familiarization firing and accuracy testing according to established American Rifleman protocol. Evaluation of the TRP 6″ 10 mm RMR began with the requisite accuracy testing at 25 yds. Five consecutive, five-shot groups with three ammunition types from a Caldwell Pistolero rest were used to determine the pistol’s accuracy potential. The full results are tabulated below. Of the loads, the smallest groups were produced with Hornady’s Critical Duty 175-gr. FlexLock, which averaged 2.02″ for 25 shots—plenty accurate for big-game hunting, defensive work and action sports. 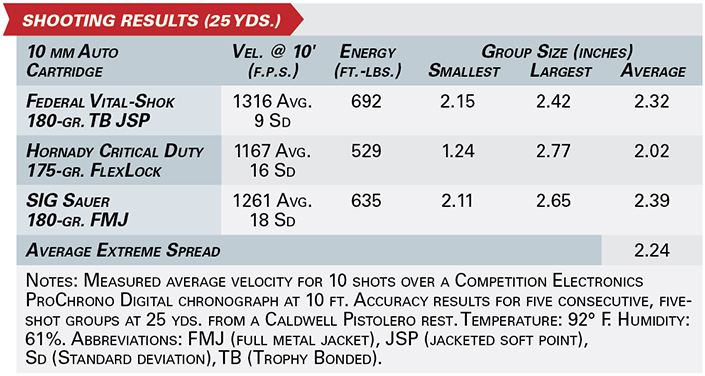 Federal’s Vital-Shok load came in second with an average of 2.32″, followed closely by SIG’s ball load. We were impressed by the purchase afforded by Springfield Armory’s Posi-Lock checkering. Case in point, the 92° F. temperature and exposure to direct sunlight led to moist hands for the evaluators, but not once did the pistol shift out of position during firing. Beyond functionality, the Posi-Lock checkering is also aesthetically pleasing. The testers also had high praise for the trigger; although a touch heavy, the trigger pull and reset characteristics were noted as superb. So, too, was the addition of the Trijicon RMR and tritium night sights, which ensure accurate sighting in all lighting conditions. Individuals looking for a semi-automatic-capable cartridge with which to hunt big game and protect themselves against predators will find the 10 mm Auto to be an excellent option. 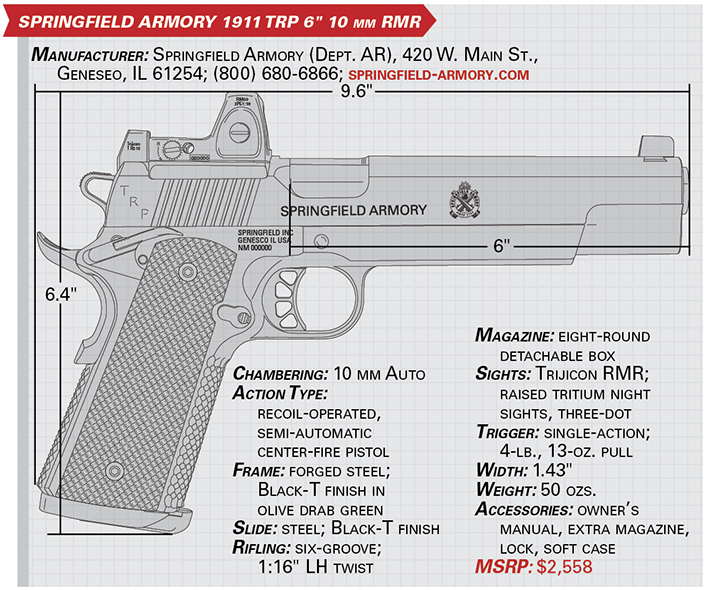 And, those who prefer the venerable M1911 will find a fine companion in the Springfield Armory TRP 6″ 10 mm RMR.